Control of a blind or shutter motor with mechanical or electronic end-position switches. 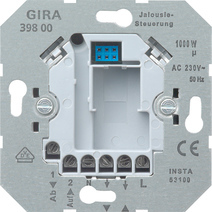 Mechanical buttons or additional blind controller inserts which can be connected via 230 V auxiliary inputs for establishing group controls. "Wind alarm function" can be realised using auxiliary inputs. Motor protection using mutually interlocked relay contacts with a minimum changeover time. Using a deep device box is recommended.